Delhi Public School, Udaipur celebrated the 70th Republic Day with great enthusiasm Aguas. The national Flag was hoisted by the chief guest Captain Ranjeet Singh Shekhawat, Commanding Officer Rajasthan Naval the NCC Unit. 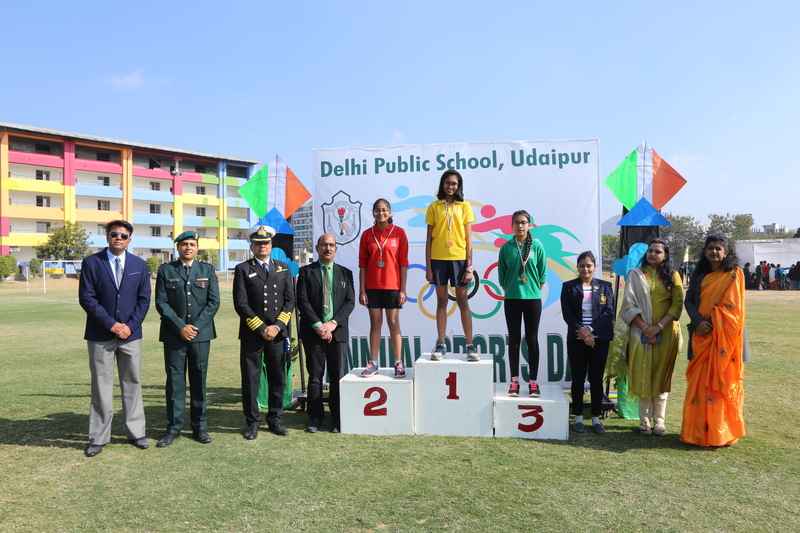 The National-level Weightlifter, Ms. Mala Sukhwal, International polo Captain Shri Raghav Raj Singh and member of school management Ms. Apoorva Agarwal Graced the occasion as the guests of honor. The Principal I/C Mr.Sanjay Narvaria welcome gathering and extended his wishes for the 70th Republic Day. Spirit of Patriotism permeated in the ambience through the cultural presentations by the students, Football Dance, Classical group dance, Aerobics and Cavalli mesmerised the spectators. The chief guest administered the oath to the participants of athletic meet. Students of classes 4 to 8 participated in 100m & 200m races whereas classes vi to ix participated in 4x100m relay race. The winners were awarded by the chief guests of honor Ganga House was a judge as the best house. The programme culminated with a vote of thanks extended by the Principal I/C Mr. Sanjay Narvaria.